Can Dogs and Cats Eat Pumpkin? Fall is just around the corner, which means pumpkin season is near! While we enjoy our pumpkin-flavored-everything this fall, you may be wondering if your dog or cat can eat pumpkin too. Canned pure pumpkin (without added spices, fat or sugar) is a healthy treat for pets to eat. Pumpkin contains fiber which can serve as a pre-biotic for good bacteria to grow in the gut. This is why canned pumpkin is often recommended as an at-home remedy for diarrhea. While pumpkin is safe for pets, it doesn’t actually clear up diarrhea very well, so be sure to have your pet seen by your veterinarian if they are having diarrhea. While canned pumpkin is not necessary for your pet’s diet, it makes a great treat. Pumpkin contains Beta-Carotene, Vitamin C, Vitamin E and anti-oxidants that fight cancer causing free radicals. Pumpkin is also high in potassium and minerals. In addition to being chock full of nutrition, pumpkin is a low calorie food. This makes it a great treat for overweight pets who need to cut out processed treats that are high in calories and sodium. 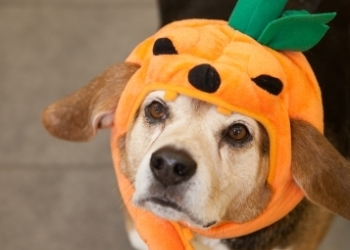 A tablespoon of pumpkin makes a delicious and nutritious treat for pets! So this fall when you bring out the canned pumpkin to make your pumpkin pie and other treats, share a spoonful with your pet for a fall inspired treat or try this delicious no-bake dog treat recipe.